Any new player can use our Sun Poker coupon code to receive a one time new depositor’s bonus of 100% up to $500. This bonus is only valid on a player's initial deposit and is only offered to players who sign up for a new account or players who have an account but have yet to make a first deposit. Remember, in order to be eligible for this bonus, you must enter our coupon code when creating your new account, as shown above. Read further down the page to find out more about our Sun Poker bonus package. After you have signed up for a new player account and used our Sun Poker coupon code to make your first deposit, you will notice that your bonus money is separated from the money you deposited. All bonus money is held in a ‘pending bonus’ balance and can be seen in the ‘my account’ tab of the Sun Poker lobby. In order to clear the bonus you must play cash games or tournaments with the money you deposited to earn Sun Points. Each Sun Poker VIP point is worth $.001, so you must earn 1000 points for every dollar of your bonus. The bonus is then paid out in $5 increments, so players need to earn 5000 Sun Poker points to release every $5 increment of bonus. If you have less than $5 left in your pending bonus account you must earn enough VIP points to clear the remaining balance. Remember that this structure of earning points is for those players with the lowest VIP Status. As your VIP status increases you will accumulate points faster (up to 300% faster). There are three ways in which a player can earn VIP points and receive their bonus money; by playing at real money cash tables, playing in multi-table tournaments, or by playing real money Sit and Go's. We will explain each method of earning points now. 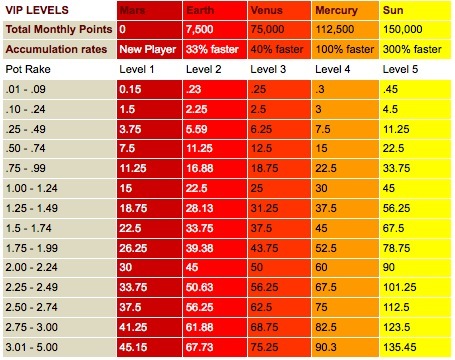 As you can see, players who are higher status, and players who play higher stakes earn points faster. The other way to earn Sun Poker VIP Points is by playing real money tournaments and sit and go's. Every time you buy into a tournament or sit and go, you pay a small tournament fee. This is how Sun Poker makes money on tournaments/sit and go's. Every dollar you pay in tournament fees is worth 150 Sun Points. Sun Poker also awards fractional points, so if you pay $0.50 in tournament fees you receive 75 Sun Points. Our Sun Poker bonus expires 90 days after you make your initial deposit. Any remaining bonus money left in your pending bonus account will expire after those 90 days. Our Sun Poker bonus is a 100% match bonus worth up to $500. That means every dollar you deposit will be matched in bonus dollars. This page was updated on January 18th, 2009, and all information is current and valid as of that date. 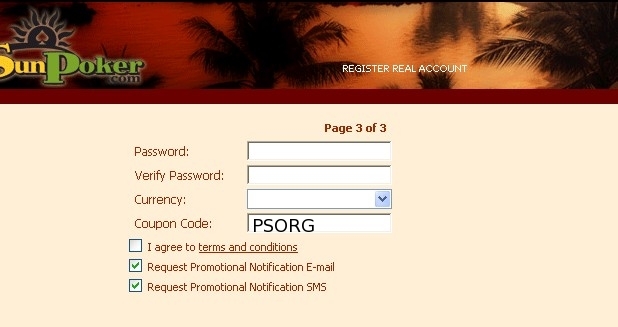 By using our Sun Poker coupon code you are stating that you are a first time depositor at Sun Poker. Future deposits may be eligible for reload bonuses. Learn more about Sun Poker by reading our Sun Poker review or our Sun Poker download guide. Sun Poker is currently located in the Netherlands Antilles and was established in 2001. Sun Poker boasts an average traffic level of more than 26,000 players during peak hours. Sun Poker doesn’t allow players from the United States, but offers players from other countries the world great promotions and bonuses.